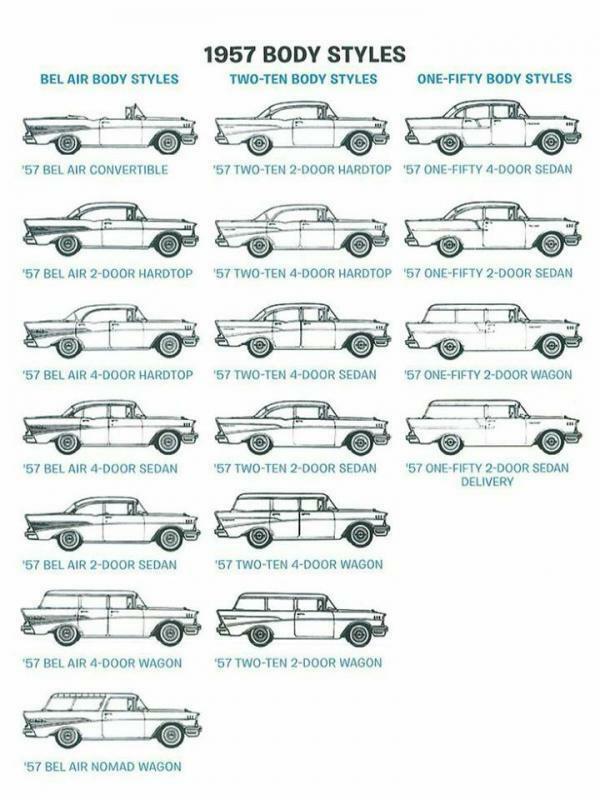 Interesting to note the 57 Sedan Delivery shown, has a paint divider, which they did't have. Besides, they were't even in the passenger car brochure, only the truck brochures, since they were built, titled, and licensed as trucks. 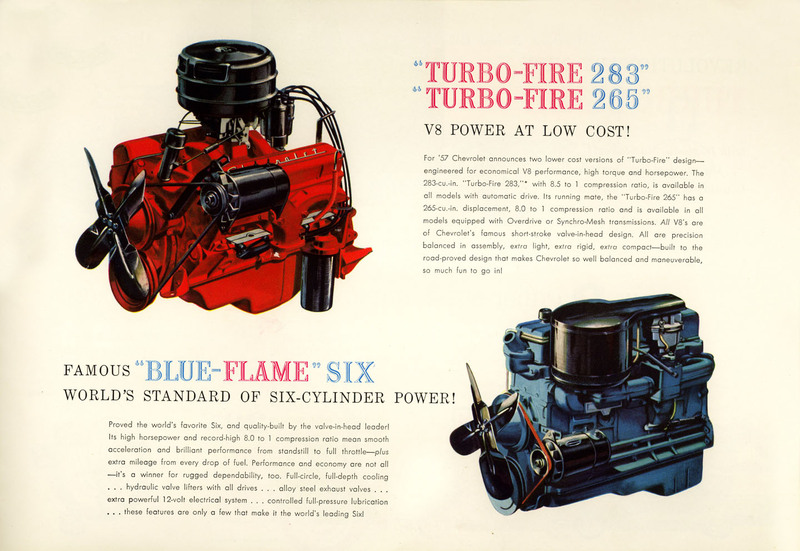 Then there's the "confusion" about the V-8; most think the 283 was the only V-8, since the 283 came out for the 57 line. Lots of "283's" out there that were really 265's. Still wish I could get my hands on a 57, 265 block. I am Butch/56sedandelivery. They sold a lot of 2 and 4-door hardtops. Did they start to see a lot of wind and water leakage between the front door windows and the rear windows, while the cars were still new? It seems to be a place where window mating alignment and weatherstrip is critical. A couple of neat ones that are somewhat a subgroup are the '57 150 2-door sedan business coupe (1211B) and the ultra-rare '57 150 sedan delivery with side windows. There was one advertised decades ago but it was in North Dakota or somewhere far away from me and I never got to see it. You also have to be careful about the semi-rare 150 business coupe as some skilled people can attempt to convert a regular 150 2-door sedan. The '57 210 2-door hardtop is also a bit rare, and in my opinion a spectacular one to get in two-tone, better than a Bel-Air. I had an opportunity to buy a 57 windowed delivery in Powell Wyoming in 1990. Wish I would have purchased it but passed for other projects. Is the only one I have ever seen. The guy that had it said they were built for the military. Edited by Jim McCall on 02-06-16 12:20 PM. Reason for edit: No reason given. Have heard about 93 1957 windowed Delivery's made for the Forestry Department. 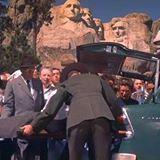 There was a 56 windowed delivery in the Alfred Hitchcock's North By Northwest. 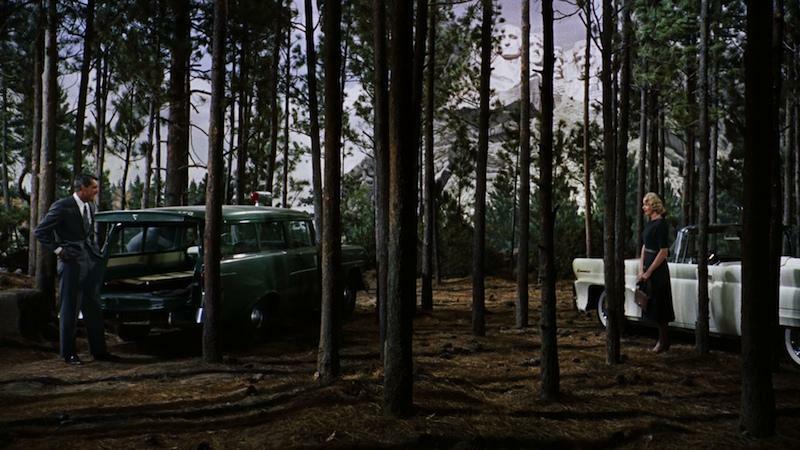 There was also a regular wagon used in some of the scenes. 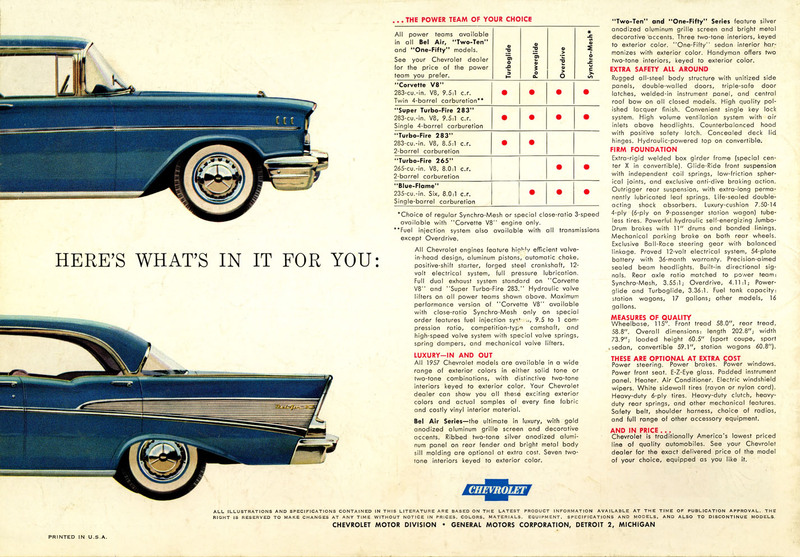 The Feds bought a number of 2 door wagons that had the one piece tail gate of the panel delivery but the glass of the wagons and no rear seats. All painted Army green. The USDA and Forestry Dept. had them. My brother had one in the late 60's. He put in a 327, 4 speed and 4.88 gears. stop light to stop light it was unbeatable. From the web " There’s a sticker inside that indicates it was a Department of Agriculture service vehicle, and judging by the one-piece bumper, it likely operated in California. Like you’d expect of a government work vehicle, it’s the most basic spec you can imagine—base 235-cubic-inch straight six with a single carburetor, three on the tree, spartan steering wheel, no armrests, no clock, no radio, and no additional trim whatsoever. " Edited by tmcfadden932 on 04-06-19 11:56 AM. Reason for edit: No reason given.